The entirety of funds raised so far has already been distributed or pledged to local partners. Impact: 115 weaver families (Kamal Rug Suppliers), hailing from Sindhupalchowk and Dolakha district. Dr. Renu Adhikari, founder/executive director of Women Rehabilitation Center (WOREC) in Kathmandu. Dr. Adhikari was in the Bay Area on April 25, 2015 when the first earthquake took place in Nepal. Just before Dr. Adhikari flew back to Nepal, ACHA hosted a gathering. In times of civil unrest, wars, and disasters, it is a known fact that women and girls become more vulnerable in society. Dr. Adhikari presented updates from Nepal stressing the ways in which communities were impacted and women were mobilizing to begin relief work. Efforts to ensure gender-sensitive relief work with special focus on safety and needs of women survivors – particularly women in the WOREC shelters who come from traumatic experiences of violence and trafficking, pregnant women and single women – were a priority while providing direct relief to families in villages. ACHA donated $500 to Dr. Adhikari for WOREC’s relief efforts. Make your checks payable to “MACHIK” and please put “ACHA Nepal Rebuilding and Resilience Fund” in the memo – very important. If you are on the East Coast, please mail them to: ACHA Himalayan Sisterhood (c/o Tsechu Dolma) 42-24-64street,Woodside, NY 11377 . OR If you are on the West Coast, you can mail them to: ACHA Himalayan Sisterhood (c/o Dechen Tsering) 1728 10th Street, Berkeley, CA 94710. We are dedicated to supporting migrant wageworkers, as a key step to rebuilding Nepal’s commerce sector. An overwhelming majority of the migrant carpet weavers in Kathmandu hail from rural hill and mountain communities most affected by the earthquake. Their source of livelihood has been interrupted. We have partnered with Stark Carpets in New York to provide support to 5,000 carpet weaver families in Nepal. Our contribution will directly support weaver families with temporary shelter, medicine, education and food. Through literacy training and organizational development ETC helps women gain the skills needed to become strong leaders in their communities. ETC provides scholarships, teacher training, building materials and more to improve the quality of education in public schools. They have been in Nepal for more than two decades and they have been in Dolakha since 2008. ACHA has pledged $2,000 to support ETC education initiatives in Dolakha district. HSYWE has over ten years of track record working with youth and women from the Himalayan and Trans-Himalayan ethnic communities in Nepal. In the wake of the earthquake, HSYWE team led by its executive director, Doma Lama, began direct relief trips to villages within the Sindhupalchowk, Rasuwa Shabru (Tibetan refugee camps), and Dolakha districts. HSYWE’s all-women team of organizers mobilized local male volunteers in the villages to help distribute relief supplies that included: tarpaulin shelters, foam mattresses, women’s emergency kits, bags of rice, lentils, cooking oil, other dry food items, flashlights, etc. for the villagers. HSYWE serves communities of Tamang, Tibetan, Magar, Sherpa, Chhetri and other ethnic groups across Nepal. ACHA has pledged $­­­­3,000 to HSYWE and will continue to raise funds to channel through this group to reach the ethnic minorities and Nepali villages in some of the hard-hit districts. Sahayeta.org is a registered 501c3 organization created by individuals who share similar stories of hardship and struggle in America, having arrived as international students, refugees and new immigrants from the Himalayan region. Sahayeta.org’s mission in the Himalayan region is to further education, health, children’s’ right, elderly rights and women empowerment. #1 On-the-ground needs assessment to evaluate effective approaches to help with recovery efforts. #2 Urgent relief efforts: Sahayeta.org is partnering with individuals and organizations in the Bay Area, Nepal and India to send food, clean water, tents, medicine etc. to make an immediate impact. $3,000 pledged funds to Sahayeta.org and HSYWE will be taken by ACHA members traveling to Nepal (at personal cost) to ensure that 100% of the funds raised will be distributed to the groups in person. We look forward to raising additional $70,000 to supporting Phase 2 (rebuilding and resiliency) in the coming weeks and months. Stay tuned for updates and thank you for your support. We will continue fundraising. Make your checks payable to “MACHIK” and please put “ACHA Nepal Rebuilding and Resilience Fund” in the memo – very important! If you are on the East Coast, please mail them to: ACHA Himalayan Sisterhood (c/o Tsechu Dolma) 42-24-64street,Woodside, NY 11377. OR If you are on the West Coast, you can mail them to: ACHA Himalayan Sisterhood (c/o Dechen Tsering) 1728 10th Street, Berkeley, CA 94710. Thank You to all our Donors! 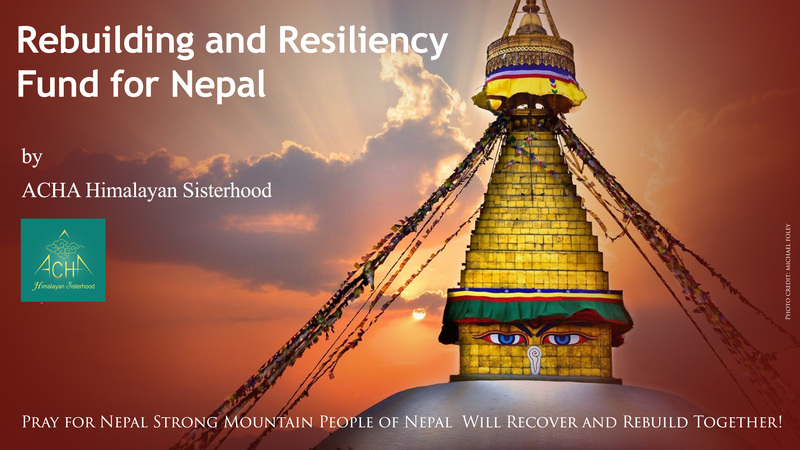 [*] Every dollar ACHA Rebuilding and Resilience Fund raises, goes 100% to direct relief and rebuilding support in Nepal. ACHA is a 100% volunteer run organization, we do not have any administrative expenses. Each ACHA member pays for her own travel and lodging expenses. [†] This fund was set up for small grassroots organizations that we may encounter in Nepal. These organizations are usually very small without much international support or attention; nonetheless, they are impactful. Once we partner with grassroots organizations, we will update. [‡] An average Nepali household, of 5 people, consumes 2.5 kilos of rice a day.